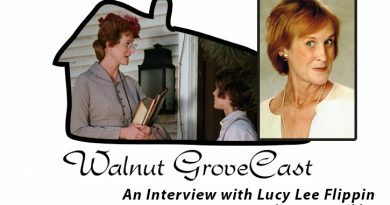 For this episode of Walnut GroveCast I am joined by the amazing Susan King! Bare-foot bumpkin Luke Sims and his hunky dad Adam, arrive in Walnut Grove. Adam is a pig farmer, (and according to Willie, “he raises hogs too”…. as will be evident at the Olson’s dinner table when Luke joins them for a meal) Adam and son stop by the schoolhouse so that Luke can get some book learnin’ and have a “women’s touch” in his life. We discover Adam is a widower and Miss Beadle instantaneously has the hots for him. Not knowing her history, Luke takes a shine to Nellie and their relationship progresses. Harriet catches them out late one night and seeks Miss Beadle’s help in stopping their romance as it is effecting Nellie’s school work. Miss Beadle protests at first but quickly realizes this is a great opportunity to see hunky Adam again Luke decides to buy Nellie a ring for her birthday, using Mary to assist him, misunderstandings galore occur with Nellie angry telling her mother to “SHUT UP” as she explains to Nellie that “ Luke bought a ring for Mary and men are fickle as weather vanes”. Luke shows up at the door on her birthday with presents in tow and the misunderstanding is cleared up. Luke, Nellie, Adam and Miss Eva Beadle spend time together picnicking, etc. and Adam proposes to Eva. She wants to think about it because of her age and school responsibilities. While pondering Adams proposal, Nellie asks Ms. Beadle about marriage (Age etc.) Miss B thinks she is talking about her, but in reality, she is contemplating Luke’s proposal to her. Both Nellie and Eva decide to wed the Sims men, Eva telling Adam in a sweet moment at his house, Nellie, and Luke grabbing a suitcase, hopping on the Oleson’s buckboard and driving to sleepy-eye to elope. Hilarity ensues as Adam, Ms. Beadle and the Oleson’s (with a rifle in tow) track them down to a hotel. Harriet’s request? 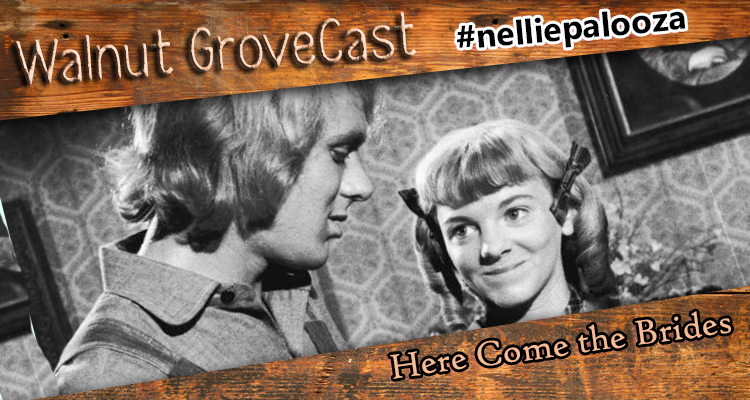 “Nels, make her a widow!” They all go back to the JP and Nellie and Luke get “unmarried”. While Adam and Ms. Beadle are there at the JP, they decide to marry….and with the exception of the JP and his wife who have been continuously awoken all night long…they live happily ever after. Was looking for a podcast for Little House on the Prairie happy to find yours. This is one of my top four favorite episodes. The actor who played the J.P.is Ivor Francis. His daughter Genie is more well known to all as Laura from General Hospital was is marred to Jonathan Frakes or William T.Riker from Star Trek Next Generation. Really love your podcast and can’t wait for more. Debra! Thank you for your kind words! 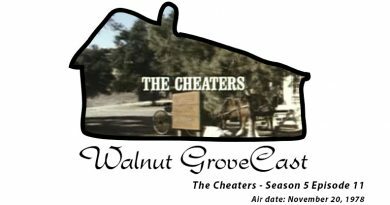 If you’re on Facebook please feel free to search for Walnut GroveCast and join in on the fun!